My friend Bob Clark (pictured) was fortunate to be able to attend photographer, and award-winning author, Scott Kelby’s, Light it, Shoot it, Retouch it seminar last month. In his fact-filled tutorial Kelby showed participants how he produces a portrait; taking participants through an entire “live portrait” shoot – start to finish – controlling studio lighting with different lighting set-ups, a how-to on working with models, and his very latest PhotoShop portrait retouching techniques for finishing. I have known Clark since my time at the University College of the Cariboo, (now Thompson Rivers University). 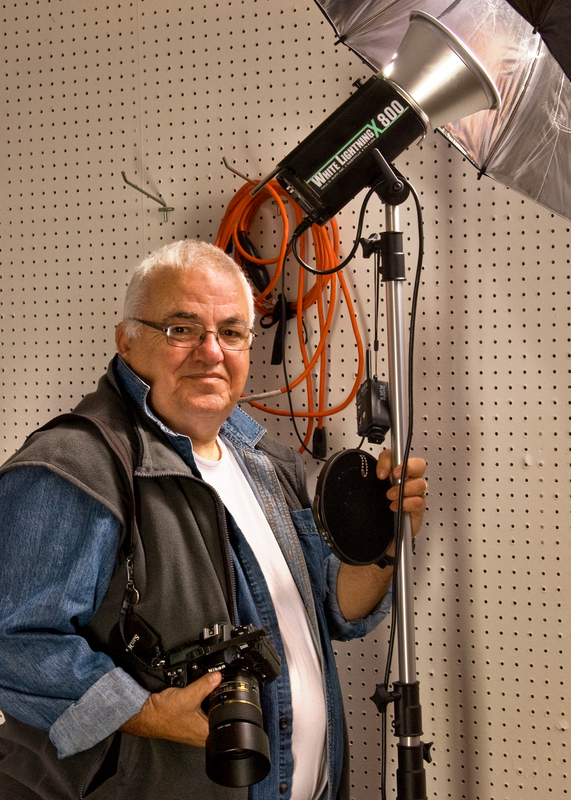 He recently retired and opened a small photo studio located in a back space of the Public’s Own Market building at 970 Victoria Street. Bob’s clients are dancers, actors, and models looking for portfolios and in his own words “people that normally would not go to a traditional photographer”. I would have liked to attend it, however my schedule didn’t work that day. I knew Clark was going and that I would be able to sit with him for a review of Kelby’s photographic discussion, so when he invited me over to check his studio out, of course, I made the time. We have always had fun bouncing ideas about photography off each other, and I wanted to see his new space, and knew I’d have the chance to quiz him on Kelby’s class. Clark told me he joined 500+ photographers in a spacious conference center fitted with two large video screens and equipment filled stage with many different portrait lighting set-ups. There was actually a full working studio on stage exhibiting moderately priced lighting equipment that the average photographer could afford, not the fancy out of reach, high priced stuff that he expected at a workshop of that caliber. Kelby began with a basic one light setup, photographed his models using different backgrounds, showed how he would use PhotoShop for those subjects; then moved to a two light setup, photographed the models again changing backdrops a few times and took that subject to finish demonstrating PhotoShop techniques; then repeated the complete process using a three light setup. I asked Bob if there was a high point or something that really got him excited during the class and he said definitely the part when Kelby photographed a model and in less than thirty minutes was able to change the background using PhotoShop. He had used a plain background then seamlessly placed the model on an album cover, and reminded participants that step-by-step instructions for that process were in the handbook provided. Clark commented that one could easily reach information overload with all the information that was being shown and discussed, but Kelby reminded all the participants that everything in the workshop would be in the techniques book handed out at the beginning of the session and that if he had strayed a bit there would be additions available by going to his website. Clark mentioned several times how much he enjoyed that class and highly recommended it to my readers. He said the class also comes in three distinct parts if one is reluctant to go for the whole package. And he emphasized that anyone will get something from Kelby’s Light it, Shoot it, Retouch it seminar, no matter his or her experience. I am hopeful the Scott Kelby road show will make the trip to British Columbia again next year and plan on attending if it does. This type of event features one of my ongoing bits of advice to aspiring photographers, and that is to continually upgrade photographic skills by attending appropriate educational seminars. Photographers talk about how wedding photography has changed. My long time friend, and photographer, Alex Neidbala stopped by my shop. Who, until his formal retirement in 2005 owned and operated Billows Photography in Kamloops, British Columbia. As we talked about how we thought that changes in photography might affect the photographic art in the upcoming exhibition he had agreed to be one of the judges for, our conversation drifted into how we had photographed weddings in the 1980s and 1990s and how much different that is from today. If one wanted superior quality enlargements greater than 8×10 the only option was medium format film, and that meant using film that produced 2¼ x 2¼ negatives. Medium format film could be purchased in rolls; mostly 120mm film size, and mostly 12 or 16 frames (pictures) per roll, depending on the camera. At that time we both used a camera called a Hasselblad. A roll of film was loaded in a 12-exposure film magazine and attached to the camera. When 12 exposures were taken another loaded magazine was exchanged for more photography. This is one of the most significant changes and very different from the 190-image, 4GB memory card I normally use today. Neidbala felt that our goal in those days was much harder than photographers have today, in that modern photographers can waste images, or give a client ten or twenty portraits of the same grouping to select from, without worrying about the cost of processing worthless prints. When a photographer is limited to changing film every twelve frames at such an important event as a wedding, every shot had to count. In addition, it took time to change film magazines, so photographers had to be prepared for every shot. The Hasselblad didn’t have auto focus lenses or any other programmable modes for that matter. Photographers had to slowly change the manual focusing lenses that were much bigger, and heavier, in size then current DSLR lenses. A metered focusing head that could be attached to the camera body was available for use, but most used a hand-held light meter and the heavy motorized model advanced film at a “sizzling one-frame-per-second”. Wedding albums contained either 5X5 or 8X8 and sometimes even 11X11 inch prints. The total number of prints shot was usually much less than 100 pictures, and each enlargement was printed in a custom lab, and any retouching was done by hand. In modern photography we are able to take major risks with our photography; and if a creative shot didn’t work, delete it and try again. Instead of being limited to 12 permanent exposures for a family grouping, one is able to make multiple exposures, select the best photo; with everyone smiling and eyes open, no grimaces or funny faces, and then delete the rest. Retouching is no longer a long and laborious task with Photoshop; and even though there are custom labs high quality enlargements can be made at home; and the thought of less than 100 photographs in a wedding album is laughable. Because digital cameras can produce images that don’t cost anything until they are printed, photographers don’t hesitate to make multiple exposures of every subject. It is not unusual for some photographers to arrive home from a wedding with over 1000 images stored on memory cards waiting for final selection. Photography has been exciting for both Neidbala and I all these years because it has been an ever-changing medium, not only with the film and equipment we used, but also in the way we put that equipment to use working as professional photographers. I recall photographers older than me marvelling on my Hasselblad. Some were intrigued while others, much like some I still meet today, felt it was better to hold on to the tried-and-true technology of years gone by. Both Alex and I sold our Hasselblads and purchased digital cameras over ten years ago and are happy we did. I wonder what the camera of choice will be for photographers ten years in the future. In the previous era of film cameras many serious photographers would come to a point when they would consider whether to upgrade from an automated point and shoot type camera to a 35mm interchangeable lens SLR (single lens reflex), or trade in the 35mm SLR for a medium format 120mm camera, and maybe even to take the climb to a 4X5 view camera. For film-based cameras it was all about the size of the film and bigger was better. I recall feeling bad for those people that had friends photograph their wedding with a 35mm camera at a time when quality wedding photography was really only produced by photographers wielding medium format 120mm film cameras. If one wanted a colourful, sharp, grain free enlargement then 120mm or larger was a must. What do I now say to a photographer that is considering a more serious approach to photography? I will always begin with the question, “what are your interests and what subjects do you like to photograph?” My short answer for digicam users is if sports, fast action, wildlife or enlargements bigger than 8×10 are the goal, then, yes, get a DSLR. DSLR cameras don’t have shutter lag when the release is pushed so sports photography is easy. Fast action demands a camera that can adjust shutter speed and aperture. Wild life photographers prefer a selection of super telephoto lenses that can be changed at will, and printing quality 11×14 or bigger enlargements are best produced with sensors that are considerably larger than what digicams provide. Digicams are perfect for intimate, candid shots of family and friends. The compact size lets one put them in a pocket and go, and if used correctly and within their limits they will produce excellent images. However, if photographers feel they have reached their camera’s limits then it is time to move on. So the question is what is the best choice for a first time DSLR? For this discussion I will put DSLR cameras in two simple categories, amateur and professional. The difference between amateur and pro cameras has surely become hazy. If I were to offer a short comment I would say the most obvious difference is durability. Pro cameras feel sturdy, are heavy and sealed against the elements. When dropped, they bounce and usually don’t break, and even with hard use will last a long time. The amateur camera generally has lighter weight and smaller size. When the first DSLRs came onto the scene there was definitely a difference in the quality of the images between entry level and professional level cameras, but that is not as distinct now. The technology for sensors and in-camera processing has rocketed. The latest entry-level model may well have the same sensor as the previous summer’s expensive pro model as the technology is transferred over. The main difference is in the weight, substance, durability, and controls. The new models are always being introduced, with that many previously great camera models will be reduced in price, or discontinued, and very soon there will be some great opportunities to purchase at reduced prices. As always there will be a flurry of megapixel chasers that change their camera with every new model upgrade, making used cameras available. There are those people who will not buy a used digital camera and that is OK, however for those who are interested how does one know what is a reasonable price? The easiest way is to go online and check out the sale prices at the big photography retailers for their new and used equipment. Know your prices before buying that camera from a good friend or family member and remember the money that you save can be put towards equipment like lenses and a good flash or tripod. Whatever the camera availability, my advice to those photographers asking the “upgrading” question is to consider what kind of photography they want to do. Talk to other photographers about the cameras that are interesting, go on line and check out the many photography forums to find out what others with that same interest are using, and attend some classes. Using a new camera is always fun and I believe learning how to control the technology a new camera offers is like a shot in the arm that gets the excitement going and helps ultimately to make better photographers. This photographer was challenged about always using flash. 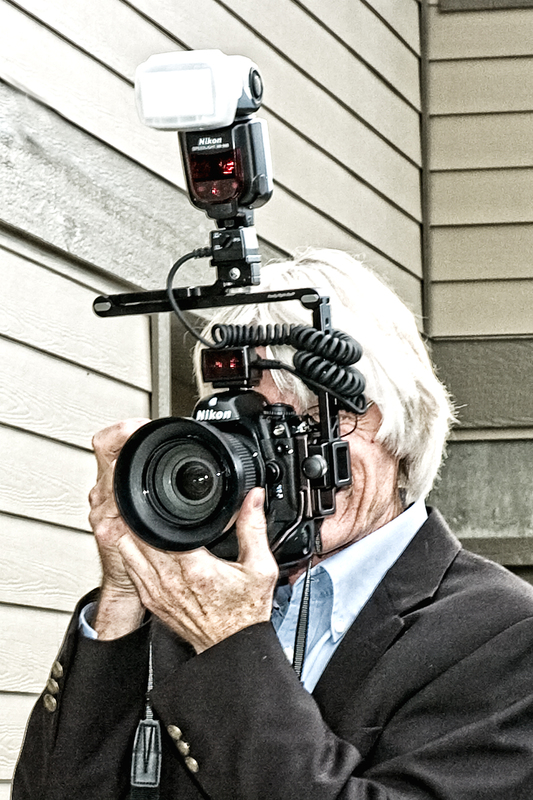 I recently had an email conversation with photojournalist Ted Grant regarding my blog entitled, “I Have Never Used a Flash”. On a sunny day the dynamic range between the darkest and the brightest areas might mean a person wearing a dark shirt could have an exposure of f4 and 1/250th second whereas the surrounding landscape might be as bright as f22 @ 1/250th or brighter. A photojournalist selects what is most important and only exposes for that, but for those of us photographing a family or a couple in their back yard, or a youngster posing beside the family pool, that isn’t an option. Our clients are probably proud of the work they put into their back yard and an over-exposed, washed out background would wreck the picture in my opinion. For me that picture would be easy. I’d quickly meter and make an exposure of the back yard, check my LCD to make sure it was a good then put a flash on my camera, have someone stand in, make a couple of test exposures, and reduce or increase the flash output if needed, and I am ready with subjects and background all evenly exposed. However, Mr. Grant is absolutely right. “If you can see it? You can shoot it!” I believe his quote came from his work on a book about women in medicine shot using a Leica 35mm and exposed on black and white film. He also likely didn’t have the luxury of fast auto focusing image stabilizing lenses, or being able to check the image and exposure history as he shot, and he likely was restrained from using TTL flash technology in his many endeavours. There are, of course, differences between photographers and how they want their subjects to look. I suppose it is really about what in the final picture is important to them. The photojournalist’s job is to capture the action as it happens, using a flash might not be possible, or even allowed in some circumstances. Whereas the type of photography I do is all about the subject who in all instances must be photographed in the most flattering way possible and in most cases that means including using a flash. A customer walked into my shop last week complaining. She said, “ My camera isn’t working. I think there is something wrong with the chip.” I thought at first that the camera’s main computer wasn’t working and then I realized she was talking about her camera’s memory card, or the small picture storage hard-drive we insert in the camera. Digital technology confronts photographers with new terminology. I have written about terminology (or jargon) in the past, but for those new to this the following may help to understand just what some of the words mean. Digital Images: The digital image is a grid of dots or picture elements (pixels). Each pixel is assigned tonal values (black, white, shades of gray, and color), the bits are then interpreted, read by the computer, and produced as an analog version for display or printing. Pixel: Picture Element: Digital photographs are comprised of thousands, or millions of them; they are the building blocks of a digital photo (see above). Sensors: When a picture is taken, the sensor is struck by light coming through the camera’s lens. Each of the tiny pixels that make up the sensor converts this light into electrons. The number of electrons, usually described as the pixel’s accumulated charge, is measured and then converted to a digital value. There are two most popular types: CCD: Charge Coupled Device; and CMOS: Complementary Metal-Oxide Semiconductor. White Balance: Is a function on the digital camera. It refers to the relative intensity of colors in your image. Without correction, a picture taken at sunset can seem too yellow or orange and a picture taken under fluorescent lights might seem too green. Some cameras come with built-in automatic white balance correction. DPI: Dots Per Inch is a measurement of the resolution of a digital photo or digital device. When printing, the higher the number the greater the print quality. Image Resolution: Is the number of pixels in a digital photo and that affects the image quality. LCD: Liquid Crystal Display: A low-power monitor often used on a digital camera to display settings or the photo itself. Histogram: A graphic representation available on the LCD, of the range of tones from dark to light in a photo. ISO: International Standards Organization is a rating describing the sensitivity of the cameras sensor to light. Generally, as ISO speed climbs, image quality drops. JPEG: A standard for compressing image data developed by the Joint Photographic Experts Group. It is referred to as a lossy format, which means some quality is lost in achieving JPEG’s high compression rates. Usually, if a high-quality, low-compression JPEG setting is chosen on a digital camera, the loss of quality is not detectable to the eye. RAW: Is the image format data as it comes directly off the sensor, with no in-camera processing. Megabyte (MB): A measurement of data storage equal to 1024 kilobytes (KB). Mega Pixel: Equal to one million pixels. Noise: Pixels in your digital image that were misinterpreted, usually at the higher ISO values. It appears as random groups of red, green or blue pixels. Shutter Lag: The time between pressing the shutter and actually capturing the image. This is due to the camera having to calculate the exposure, set the white balance, and focus the lens. It is usually a problem with small point and shoot cameras. I enjoy looking at pictures, especially at portraits of people. I am not so interested in the image content, or subject, as I am in the process of how the image was made. I study the environment, background, camera angle, the subject’s pose, and, of course, lighting. I am continually searching to add something new and valuable to my own photography, and there isn’t much better way to get new ideas, and learn new techniques, than studying how other photographers work with their subjects. I was impressed at a lecture I attended given by Jim Britt, who in 1972 was photographer at Motown Records. (Britt did Michael Jackson’s early photographs.) At the lecture Britt discussed studio portraiture lighting which was all very interesting, but what stuck with me was that he said we should continually be changing how we phototograph our subjects, to not be too predictable, or to get caught in a rut, and to emphasize that he remarked we should never say “it’s my style” because “That just makes you a cliché”. I do try to be creative with my portraiture, remembering that a good portrait should have lasting power. I want future generations to see a portrait of their parent or grandparent and still like it. If one gets too edgy, or trendy, the portrait will not stand the test of time and be discarded by its owner when trends change. Many of the portraits I see show people too quickly photographed under unflattering lights, uncomfortable, awkwardly posed, and struggling to stay calm. When someone asks me for a portrait I never move into candid mode; I try to gain a degree of mastery over the location, the lighting, and an understanding of person I am about to photograph. 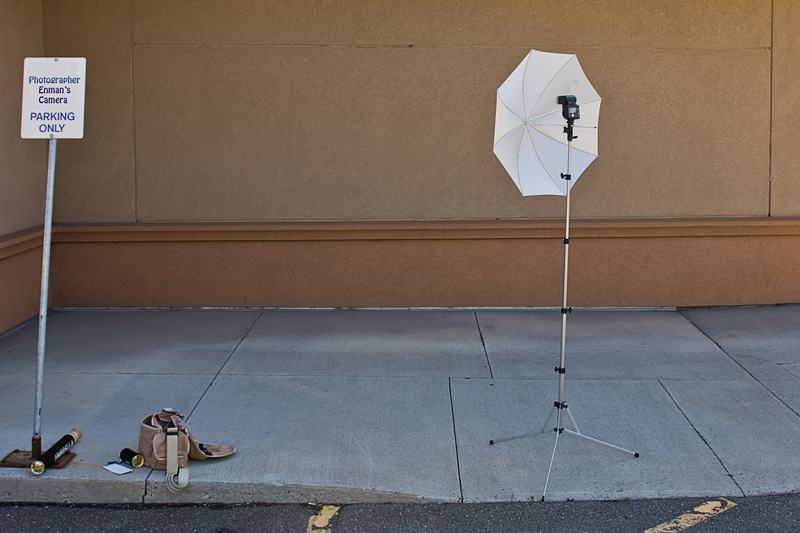 That means I evaluate the location, the background, and how much room I have between me and my subject. I check the ambient exposure, and decide if I need to add lighting. And when the person that I am about to photograph gets in front of my camera I start working at making them relax, and get in the mood. This usually means talking a lot and directing the session. One of the most famous portraiture photographers, Helmut Newton said, “My job as a portrait photographer is to seduce, amuse, and entertain.” I absolutely agree with his assessment. A photographer standing with a camera up to their face waiting for the perfect expressive moment would generally make the subject to be photographed nervous. I am sure there are times when candid portraits work quite well, and there are those people that are “naturals” and just know how to pose, but in my experience most people rely on the photographer for direction. Portrait photography is more than pointing a camera at someone and releasing the shutter. However, there are those out there that obviously don’t agree with that, or we wouldn’t have as many portraits of uncomfortable, awkwardly posed people under unflattering lighting. Maybe the problem is the obsession so many have with camera technology, or maybe it’s something more egotistical with feelings that there isn’t any need to learn from others. My advice? Don’t be in a rush, interact with the subject having developed a plan, don’t take the lighting for granted, work with it; and remember that you, your subject, and any others who will view the portrait, have to like it.